ParkCAD™ provides users with superior control and flexibility to help make car parking design projects easier for engineers and architects. 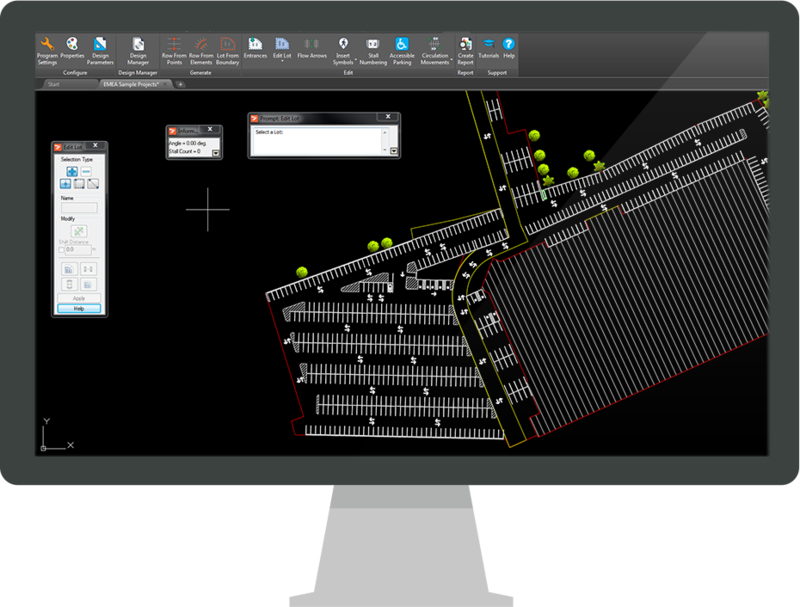 The latest version builds upon the industry tested and trusted ParkCAD and adds to it tools for enhanced presentation. Discover how the latest ParkCAD release compares for quick planning and designing of parking sites for most sizes and shapes. Creates economical and environmentally sustainable designs by minimizing a lot footprint and eliminating under-used space. Quickly test different parking scenarios to meet aesthetic, design, and functional needs. Defines where parking should be excluded with Parking Exclusion Areas. Physical Exclusions are ideal for structures, and landscaped areas. Access Exclusions are for drive aisles, and entrance/exit placements. Sets row angles and shifts in increments to complete a parking capacity study with Maximize Lot. Options for different parking island treatments (Concrete, Landscape, Painted, Default) for use in general lot design and cost estimating.